Star Wars Tusken Raider 20 back design mock-up: There are a few interesting characteristics of this particular proof card. 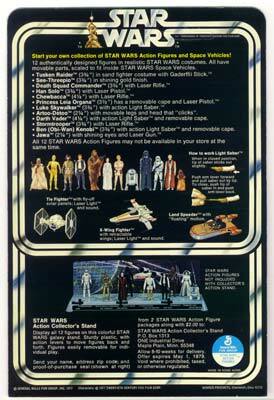 First, notice that although it is like other 12 back proof cards, it lacks the LP ("Long Playing Toy" logo and price area (top left) that was used up until the second issue of original 12 characters on 20 back cards. The initial run 20 backs still contained these areas and is often called a "20 back with 12 back front" by collectors. 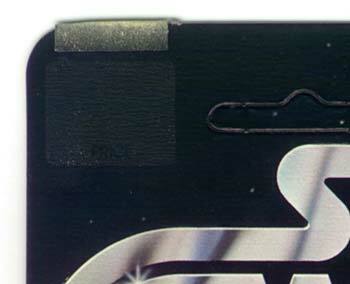 Upon closer examination, you can see that those parts of the card were actually painted over, most likely to show what the card would look like once these items were phased out. It's interesting to note that the only mock-ups found like this were Tusken Raider and Jawa, two late releases of the 12 back line. 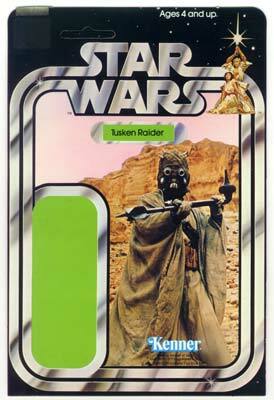 Of further interest is the fact that this card features "Tusken Raider" while it was actually changed to "Sand People" on production cards. 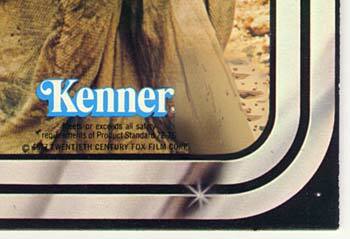 Later in the line, Kenner went back to using "Tusken Raider" for this character, putting "Sand People" in parenthesis. It's not known why the name was changed.